This week, it's a feast for the ears. 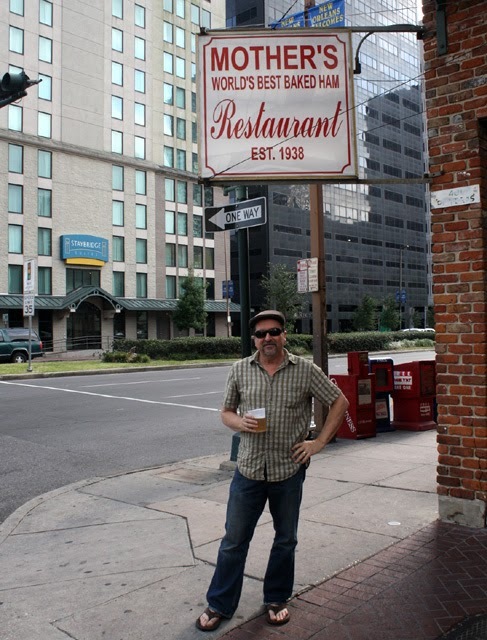 The 99 Cent Chef ends where he began: Breakfast in Louisiana. 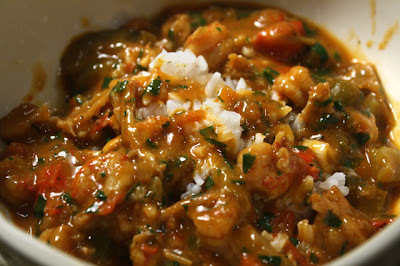 Last week I featured Crawfish Etouffee, my final Cajun Cuisine Diary recipe. After this post, it's back to my normal format of unique budget recipes. No overriding menu theme, just scrumptiousness wherever I can find it. For my final Cajun video, you will eavesdrop on audio clips from my two months long Louisiana vacation food diary series. 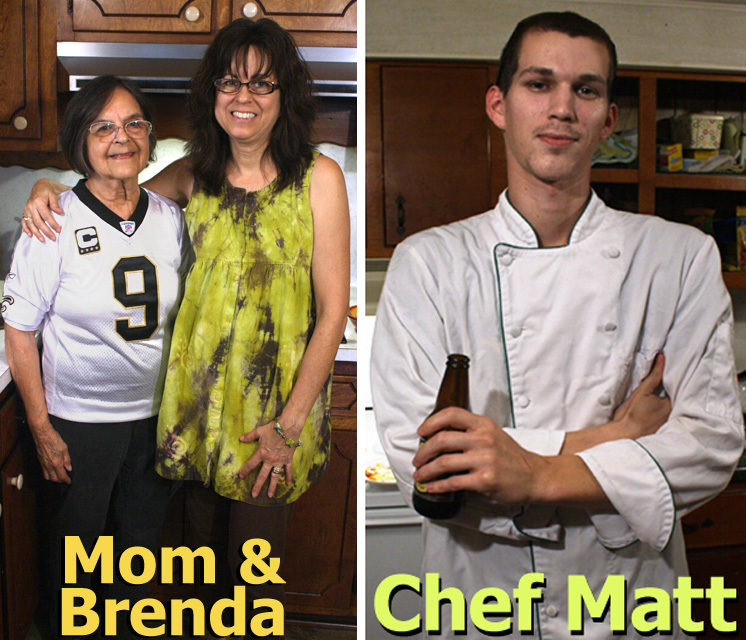 Listen in as my family paints quite a culinary aural mural of Cajun delicacies. The Cineste Chef ties all the voices together with a baroque camera move that the film masters of the long-take dolly shot would be jealous of: Jean-Luc Godard, Paul Thomas Anderson, Orson Wells, Brian De Palma, and Martin Scorsese -- just click on one of their names to see what I am talking about. I hope you had as good a time is I did -- taking in my very personal tour of the sights and sounds of Cajun Country. I have to give a huge 99 Cent Chef thanks to my Louisiana family and friends for an unforgettable vacation. 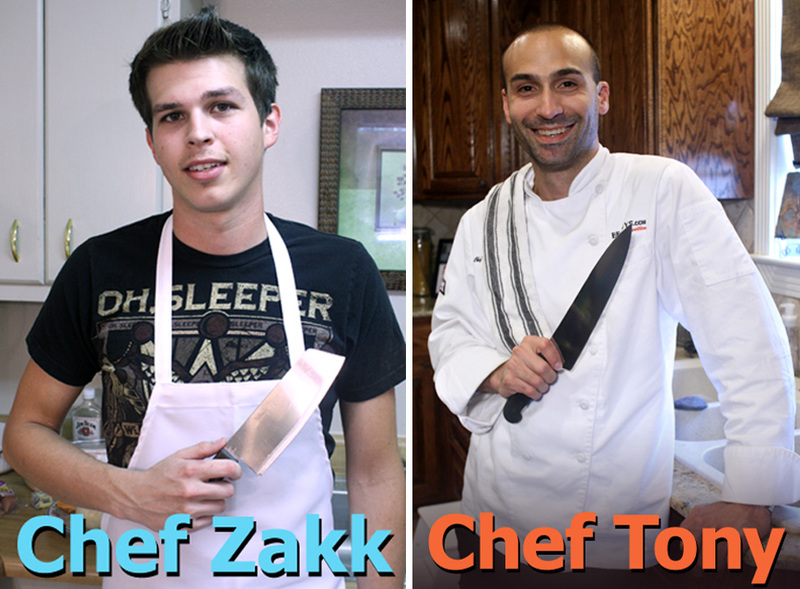 They are fun to hangout with, and are enthusiastic, passionate Chefs -- one and all! Play it here. The video runs about 1 minute and 11 seconds. Cooking rice at eight years old? 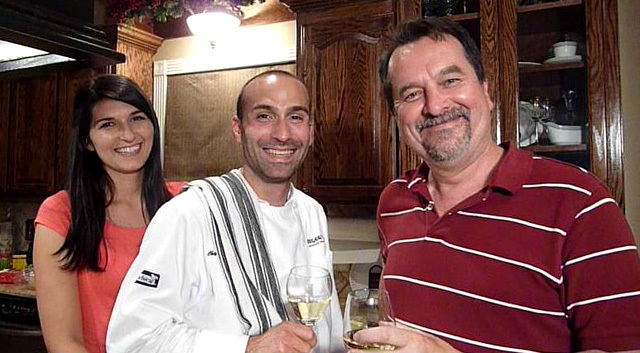 That's how Chef Tony Matassa started his culinary career in his parents' Louisiana Italian restaurant. Don't worry, he wasn't exploited - this was his natural calling from the beginning. Hanging out, we went though Chef Tony's vast culinary repertoire looking for recipes worthy of shooting, finally narrowing it down to a Cajun classic: Crawfish Etouffee. So for this cooking video, I'm stepping aside and letting a Cajun cuisine expert take over! 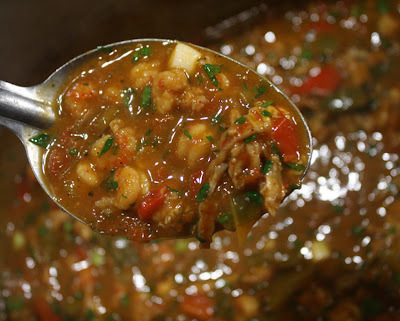 A Louisiana Etouffee has a tomato and vegetable base -- it's like a thicker pasta sauce that is served over rice and can be made with any seafood and meat. 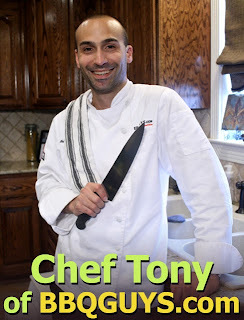 And as Tony states in the video there are many versions, some with a roux (slow-cooked flour and oil) and some without. As with any regional recipe, every town or city will claim theirs is the best - hey, can't argue with that, as long as it's delish. For Chef Tony's recipe, he uses a pound of locally harvested, "partially" cooked and peeled Crawfish tail meat. To make seafood Etouffee cheaply at home, I would use three thawed 5-ounce packages of bay shrimp (or scallops) from my local Alberson's market or 99c only Store. 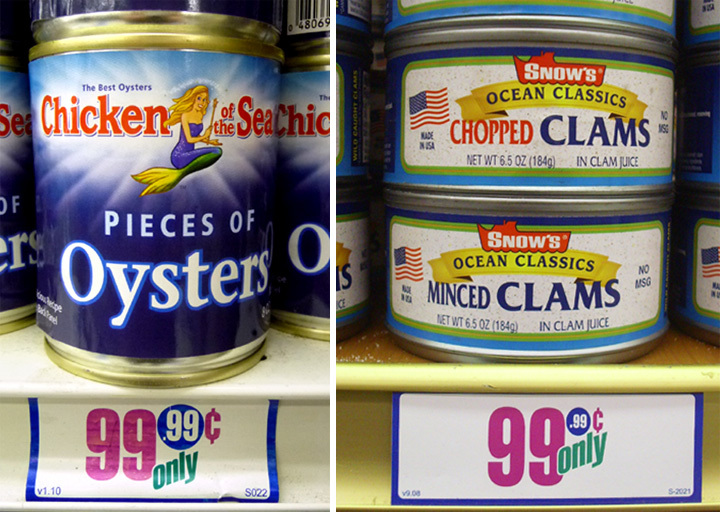 For an even cheaper version, use a pound of fake crab (Krab) -- or, you could even make a Chicken and Sausage Etouffee. Chef Tony uses butter, which you can substitute with a favorite oil. The Etouffee veggies are cheap anywhere - just bell pepper, tomato, onion and garlic. He also added a seafood broth from a small can of oysters (whole or pieces), which I still find at my local 99c Only Store - you could substitute with clam juice. You are in competent hands with Chef Tony, as he guides you though the steps in making a luscious Crawfish Etouffee. I've added a short video extra of Chef Tony's Rice Recipe in the Directions section at the end of this blogpost. Also included are a few ingredient substitutions and shortcuts that make it cheaper or more convenient. Of course, Chef Tony would prefer you go his buttery way -- it tastes best. 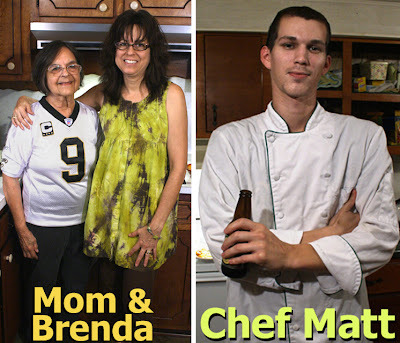 To see a Louisiana chef in action, just click on the videos below to get the surprisingly easy instructions. Play it here. The video runs 6 minutes, 57 seconds. 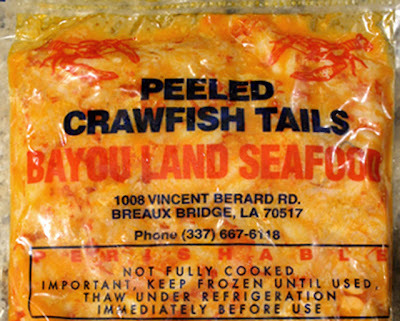 1 pound crawfish tails - or peeled shrimp. Other versions include: Krab, Scallop, Sausage or Chicken. Or combine a couple of them. 1/2 each red and green bell pepper - okay to dice one whole bell pepper, any color. 2 Roma tomatoes - or 1 large tomato, chopped. Okay to use 1 can of tomatoes or favorite pasta sauce. 1 1/4 stick of butter - The 1/4 stick of butter is added to Etouffee just before serving (optional.) 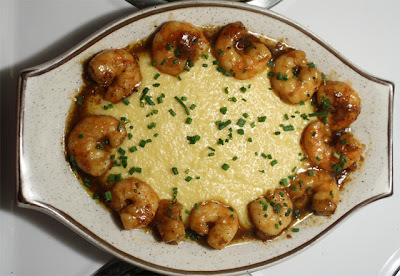 Okay to substitute 3 tablespoons of favorite oil, for a lighter version - 2 tbsp. for sauteing and 1 just before serving. 2 cloves of garlic - about a teaspoon, minced, or pre-chopped from jar. 3 green onions - sliced. Discard roots and old green ends - use white and light green parts. Broth from small can of cooked oysters - or clam juice (this is for extra seafood flavor - you could leave it out.) If you are using fresh shrimp, boil shells (and heads) in 3 cups of water, then remove shells - this is all the liquid you will need. 2 teaspoons of cornstarch - into reserved 1/2 cup oyster/water broth. 1/4 teaspoon of Old Bay Seasoning - optional. To a pot over medium heat, (or large skillet) add 1 stick of butter, and melt. For a lighter version you could get away with half the amount of butter, or substitute 2 tablespoons of olive oil. Roughly chop one whole onion and 1/2 red and green bell pepper. Mix in tomato, bell pepper and tomato and cook 10-12 minutes. Salt and pepper to taste. Add minced garlic and cook about 30 seconds. Now to make a simple seafood stock. 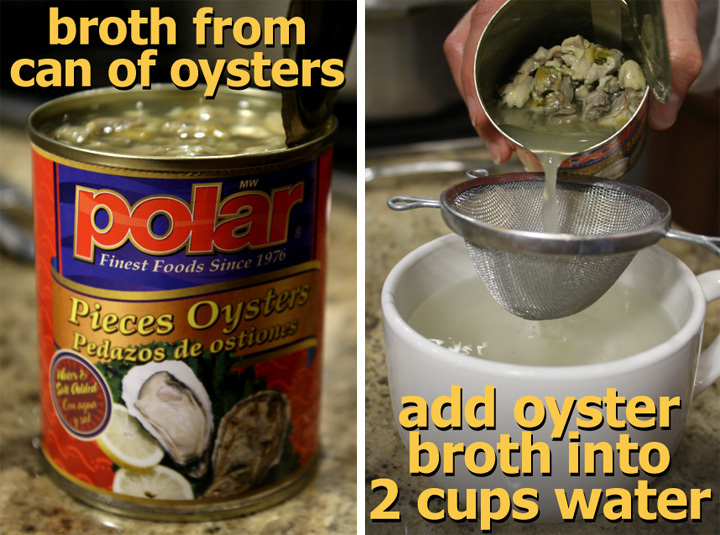 Pour liquid from a can of cooked oysters into 2 cups of water (discard cooked oysters.) 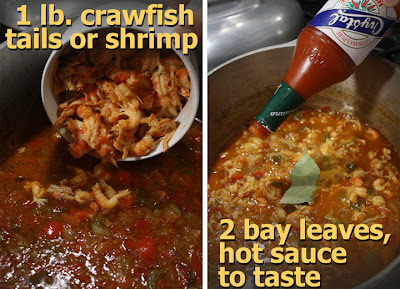 Okay to use small can of clam juice, or a cup of stock from boiled shrimp shells. Set aside 1/2 cup of stock for later. Simmer veggies and oyster broth for about half an hour to bring all the flavors together. Now time to add the seafood. Add 1 pound of peeled crawfish or shrimp. Bring to a boil, then reduce heat to a low simmer. Add 2 whole bay leaves. You can shake in a few shots of your favorite hot sauce - optional. Cook uncovered for 10 more minutes at low heat. 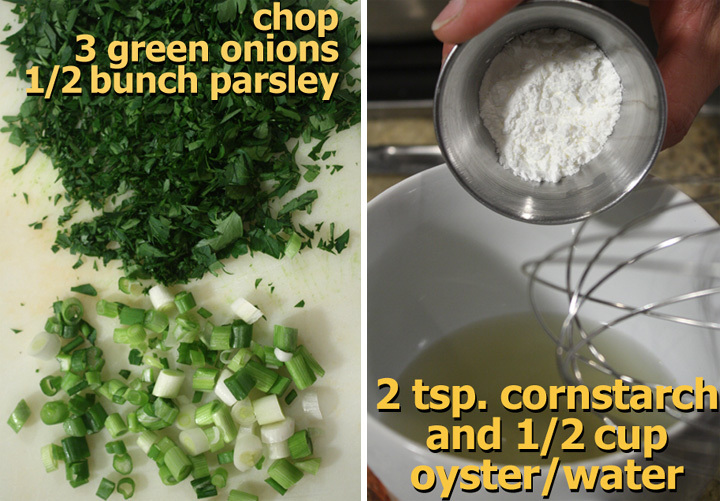 Spoon 2 teaspoons of cornstarch into 1/2 cup of reserved seafood broth -- blend well. Stir cornstarch liquid into pot of veggies and crawfish. Sauce should start to thicken into a gravy after a couple of minutes. Let it cook for about five more minutes over low heat. 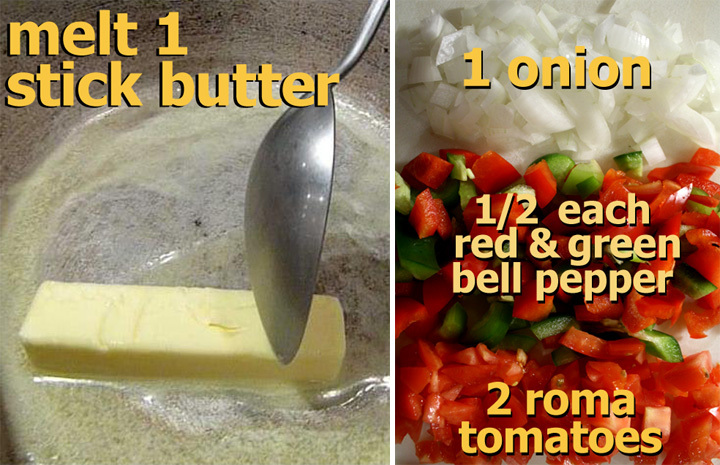 Just before serving, add 1/4 stick of butter to sauce and stir until melted (or substitute a tablespoon of olive oil). Also, discard bay leaves. Serve over white or brown rice. And get out the hot sauce and beer (or wine)! 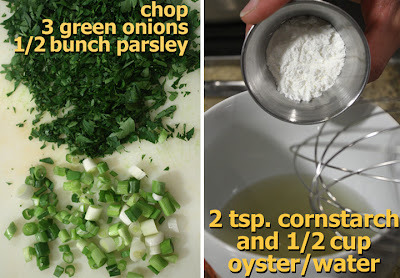 Shortcuts include: leaving out parsley, green onions, Old Bay Seasoning, and canned oyster broth. You could also substitute flour for cornstarch. Chef Tony uses a lot of butter, I'm sure half the amount would work just fine. 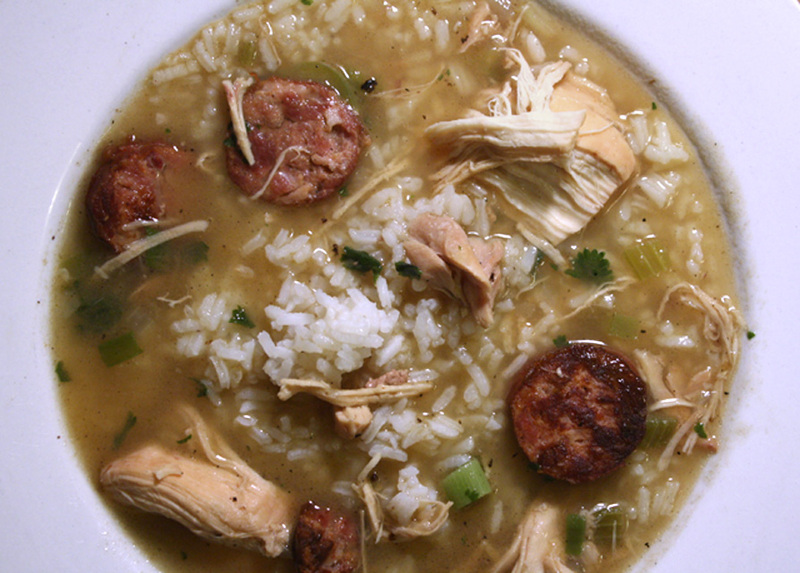 You will need to cook an extra hour if you are making a Chicken and Sausage Etouffee. You want liquid in sauce to reduce some and the chicken to cook all the way -- so simmering time may vary, depending on your pot and stove top heat. Also leave out oyster broth. I would start the rice during veggie simmering stage, either white or brown. Follow bag directions, or watch Chef Tony's Rice Recipe below. Play it here. The video runs 1 minutes, 17 seconds. Nothing goes better with a free concert by a folk-rocker in the park than delicious picnic sandwiches by The 99 Cent Chef. 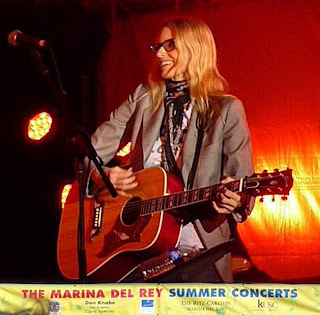 My wife didn't have to drag me to Marina del Rey's picturesque Burton W. Chace Park to see songstress Aimee Mann -- especially when all we had to pay for was parking and a few picnic ingredients. So last Saturday, we hit the freeway for a show that spanned a beautiful summer evening from sunset to full moon. At an outdoor stage in the marina's waterside park, we found a hilly spot right there, and laid out my sandwiches on a blanket, then opened our first bottle of wine. The crowd was a local mix of families and hipsters. Aimee started right on time (7pm). She played a great show, with a sliding, tuneful, lead vocal, while strumming amplified acoustic guitar, accompanied by her band. The show inspired me to film and edit a recipe video underscored by her live performance. For our picnic, I easily assembled the sandwiches from ingredients from my local 99c only Store and Latin market. 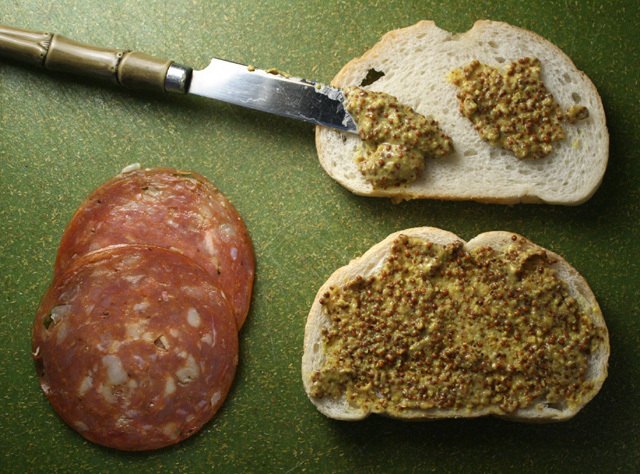 For my first sandwich recipe I made a Salami and Dijon on Sourdough. The 99c Store has recently been stocking higher-end 3.5 oz. 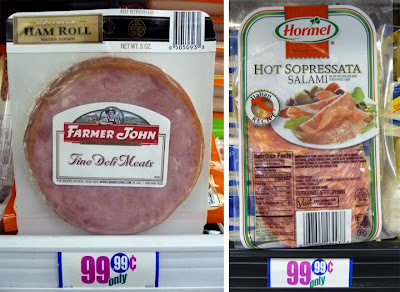 packages of Hormel Genoa and Hot Sopressata Salami. I especially like the Sopressata -- it's lean ground with white flecks of marbling. I also picked up a great Country Dijon by Morehouse. 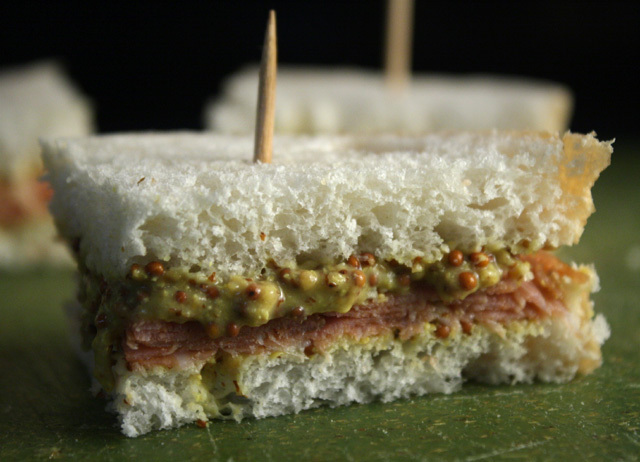 This condiment is rough ground whole mustard seeds -- popping with tangy flavor. I served it all on sourdough bread, but you could use any bread or roll you have on hand. 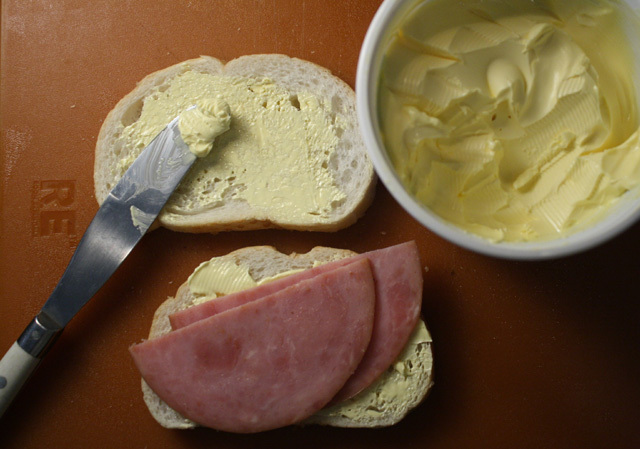 A typical French Sandwich is simply made with butter, ham, cheese, and crusty French bread. I would normally make it that way too, but since this is a blog for cheapskates, I used imitation butter and slices of Farmer John's "Ham Roll !" Now, was it as good as a Parisian sidewalk cafe classic? Of course not, but no one in our party complained. You can make it with expensive ingredients to impress your foodie friends, if you have the dough. So for your next summer outdoor concert, feel free to make any, or all, of my Picnic Sandwiches. And if you like this musical recipe video, be sure to also check out my video of conductor Gustavo Dudamel leading the L.A. Philharmonic at the Hollywood Bowl. His "Rhapsody in Blue" becomes the soundtrack while his namesake hot dog is assembled at Pink's, L.A.'s most popular fast food joint. To view it, just click here. Play it here. The video runs about 7 minutes. To view or embedd from YouTube, click here. And she plays the Hollywood Bowl tonight in a Joni Mitchell tribute, info here. On 2 slices of bread, spread Dijon mustard. Layer on slices of your favorite salami. I used thin-sliced, so about 6-8 slices per sandwich. Slice into quarters and fasten with a toothpick. Smear cream cheese thickly on Russian or pumpernickel bread. 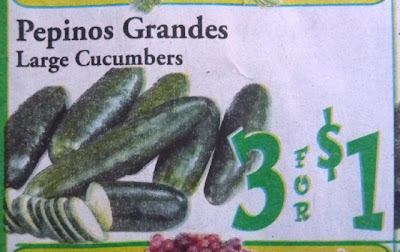 I like to peel off half the skin from my cucumbers. I also slice them pretty thin (see photos.) 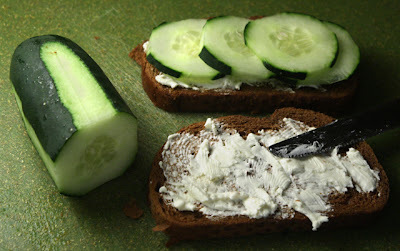 I used about 4-6 cumber slices per sandwich. Layer on the slices. 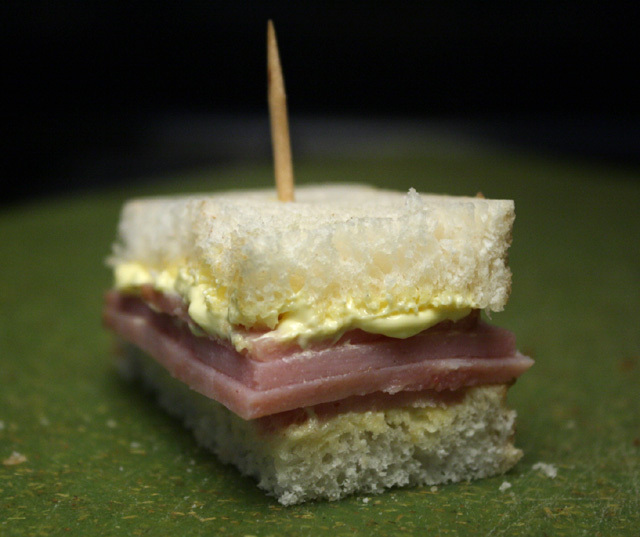 Cut sandwich into four rectangles and hold together with toothpicks. I spread a thick layer of margarine on a couple of slices of French Bread -- you can substitute with real butter (room temperature.) I often pick up real ham slices at my local dollar store, but this time I used 2 slices of a Ham Roll by Farmer John (surprisingly, quite good.) 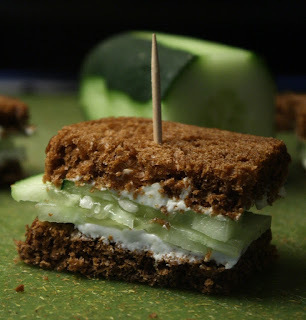 Again, slice sandwiches into quarters and fasten with toothpicks. I left out cheese, but a good addition would be a slice of Swiss cheese. If you are making your sandwiches ahead of time, make sure to store in the refrigerator. They will come to room temperature by the time you reach your destination. 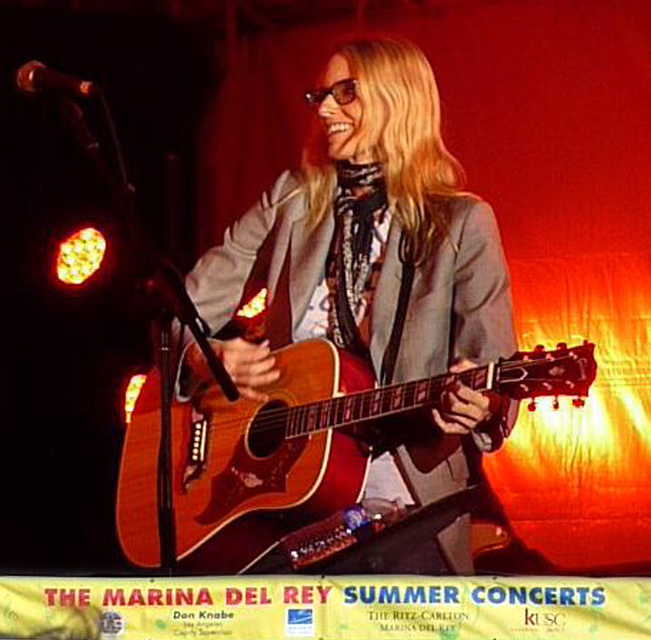 99 thanks to Aimee Mann and her groovy band -- they made our picnic a summer highlight. In my second video on New Orleans cuisine, I take you to the world famous Cafe Du Monde. A couple of weeks ago I posted a video about savory Po' Boy sandwiches in the Big Easy -- now it's time for something sweet. Cafe Du Monde is a must stop when you are touring the French Quarter in New Orleans. Open 24 hours, every local has had coffee au lait with beignets here. The coffee is flavored with chicory, and the beignets look like they've been hit by a powdered sugar avalanche! 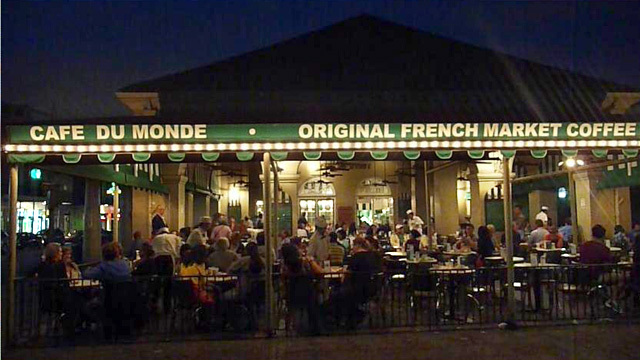 The original Cafe Du Monde was just a stand started in the 1860s at the French Market. Now it has a huge green and white striped awning which covers the patio and a smaller indoor dining area -- all barely cooled with ceiling fans. Want a behind-the-scenes tour of the place? The 99 Cent Chef has it. 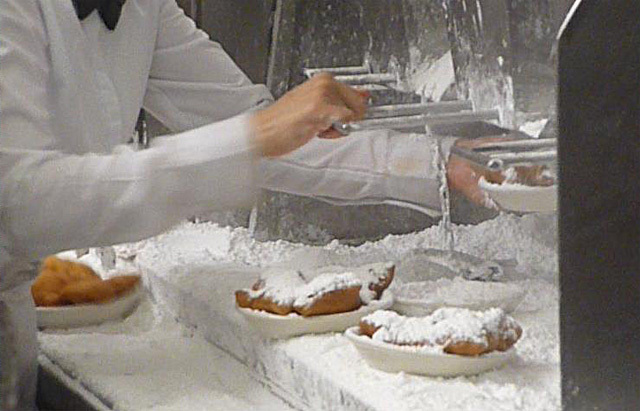 You'll see the waitstaff busting coffee cups and beignets amid snow drifts of powdered sugar. And its cheap -- 3 beignets and coffee for about $5 total. The coffee beans are dark roast. To tone down coffee's bitterness, it's brewed with chicory. You can order your coffee "black" or light brown "au lait" -- au lait means half milk and half coffee. 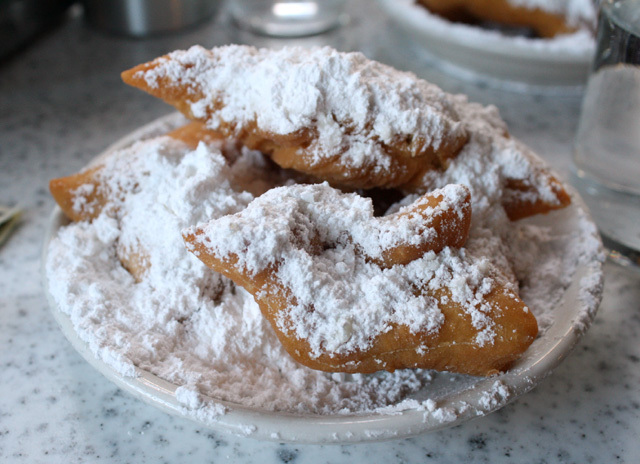 The beignets are deep fried squares of pillowy dough covered in powdered sugar. 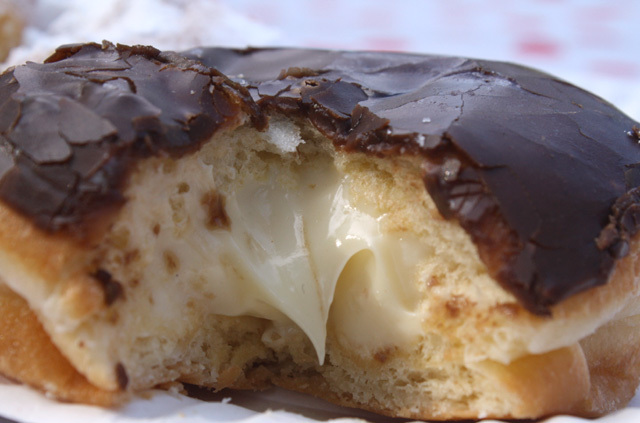 Yeast is used, so the doughnuts are light and airy like a sponge. You will get dusted with white powered sugar, so make sure to lay out napkins on your lap, especially if you are wearing black. I usually shake off the powered sugar -- enough is left on to sweeten the beignets. If you want to make your own homemade beignets, Cafe Du Monde has a mix to sell you on its website, here. 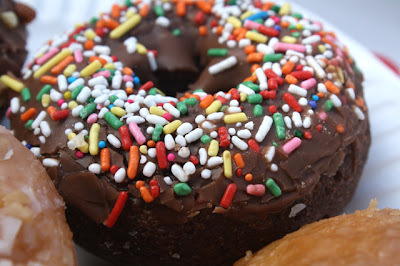 Or you can just use my Krispy Kreme Doughnut recipe, that's posted here. The only thing you need to change about my recipe is to cut the doughnuts into squares, and, of course, don't punch out a donut hole. Cafe Du Monde is a great way to start, or end, your French Quarter tour. Play it here. The video runs about 1 minute and 32 seconds. 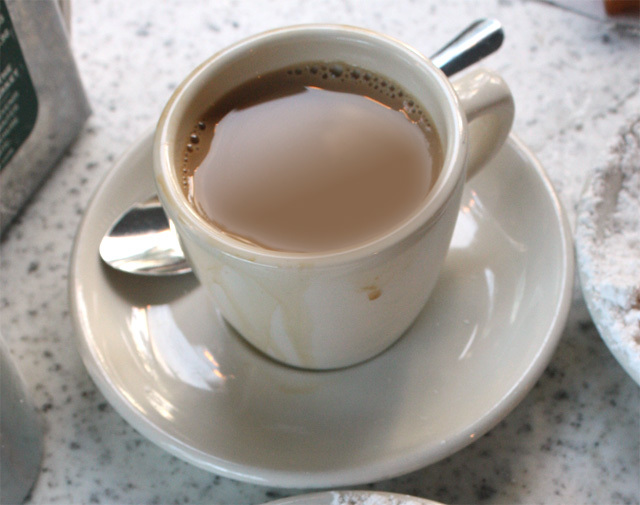 Cafe Du Monde - for various Louisiana locations, click here. Calling all donut lovers! 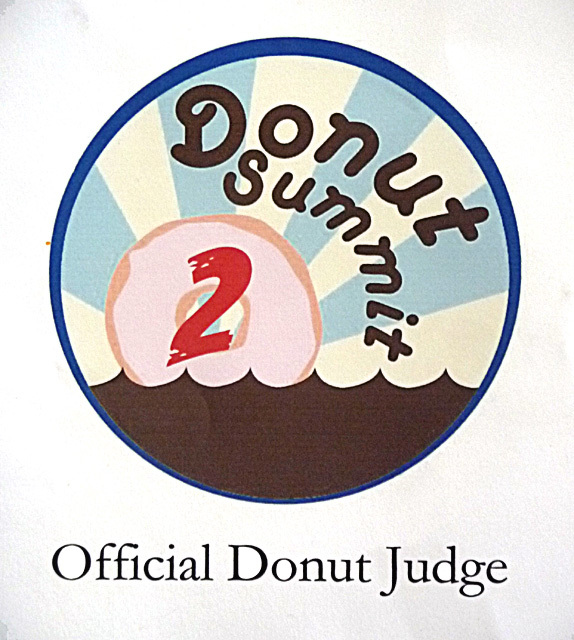 Imagine my feelings when I was called up on to be an "expert donut judge" at the second annual Donut Summit of Los Angeles. My mouth watered, my stomach rumbled, and I though, do I have the chops? And do I know enough about glazed or cream-filled treats to fill those shoes? It seemed like an overwhelming responsibility. 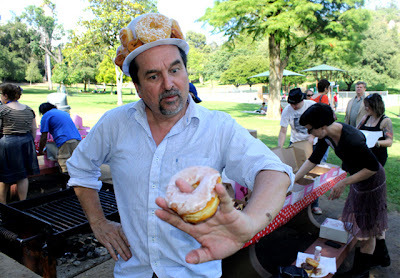 But I did create a Krispy Kreme Doughnut Recipe video (click here - it's my most popular post), and I've sampled my share of crullers and dunkers, so I concluded that I do know something about the art of dough punching. I set off accompanied by my neighbor and frequent collaborator, comedian Pete (to see some of his on-camera hijinx, click on Hitting Veggies or Pedro Pe's Shrimp Quesadilla Recipe). With camera batteries charged and a bottle of chewable antacids, we hit the freeway for a sugar-coated adventure. Arriving at Elysian Park, near Dodger Stadium, we were greeted with the smells of cinnamon, coconut flake, chocolate glazes and vanilla cream filling. All manner of donuts brought from every corner of our metropolis, and loads of people -- from hungry tykes to diet-breaking adults -- were hunched over picnic tables to sample them all. 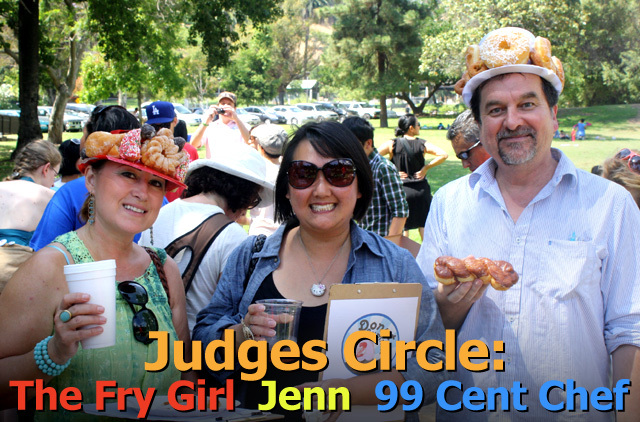 I was presented with my judge's crown -- a white hat with half a dozen donuts threaded and hot-glued onto the brim. 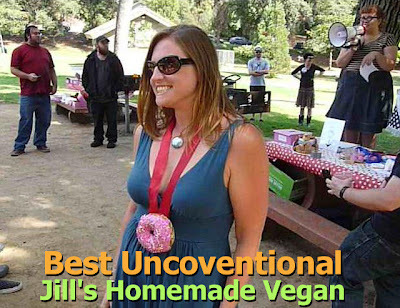 Then a clipboard was placed in my hands, presenting a bakers' dozen of "Best" categories, including: Raised (yeast), Frosting, Fritter, Chocolate, Donut Filling, Cake, Visually Appealing, Roundest, Unconventional, Overall, Worst, Judges Choice Award, and Best Vegan. I dove in and got to work - quickly discovering some donut highlights, such as the Peach Donut from The Donut Man, the Chocolate Chip Bar from California Donuts, and the Peanut Butter Donut topped with chocolate from Stan's Donuts. The coffee house Intelligentsia supplied iced coffee -- a perfect accompaniment on this warm summer afternoon. 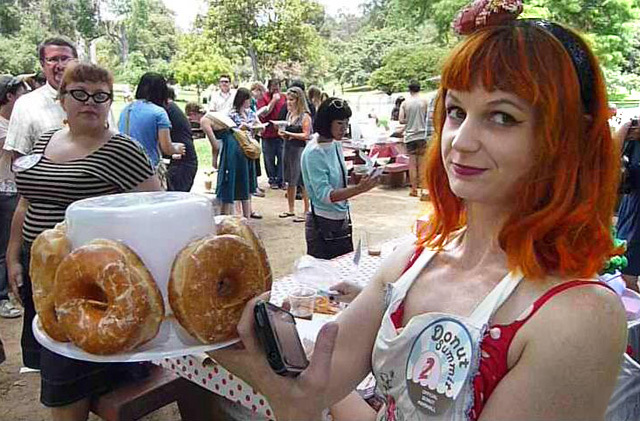 This being a park, the Blogging LA crew took full advantage, setting up games of Donut Croquet, a "fill the hole" Donut Hole Toss, and a Donut Poetry Slam, all caught on my video. Check out the winning limerick, called "The Babysitter" -- it's hilarious. Best of all were the prizes for the winners - 'Golden Donut' medallions topped with pink frosting that the beaming winners wore draped around their necks! 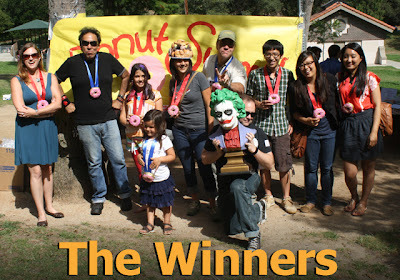 Click here to see Blogging LA's list of donut champs. The crew of bloggers at Blogging LA were definitely fun and creative hosts. Chef hats off to Frazgo and Alexandra Apolloni, who called me in to judge the fried batter bash. 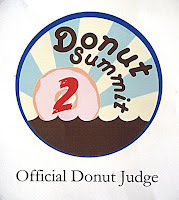 So check out the Culinary Cutup's latest video - Judging the Donut Summit 2 - your sweet tooth will be satiated. After you view the footage of kaleidoscopic confections, you may need to break out a shot of Pepto-Bismol spiked with Bourbon, to comedown from the contact sugar high! Play it here. The video runs about 5 minutes 30 seconds. 99 thanks to Frazgo, Alexandria, and all the Donut Summit 2 creative crew from Blogging LA. And bonus thanks to all the participants who brought such delicious donuts. Fellow Judges (click on names for links): Jenn of Just Jenn Recipes (her post here) and Shelly The Fry Girl. Also, 99 thanks to neighbor Pete for extra camerawork and comedy contributions. We enter the belly of the Cajun beast for a New Orleans video tour in the latest 99 Cent Chef Cajun Cuisine Diary. It's an overstuffed visual experience with a dizzy montage that starts with a New Orleans famed street car ride to the French Quarter. 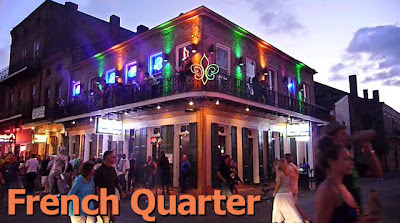 I'm glad I recorded my experience, as most of it is now hazy, after finishing off a huge, sweet, syrpy Hurricane cocktail on Bourbon Street! The rest of the video takes you on a delicious Big Easy Po' Boy Tour. You will want to bookmark this video, if you every visit the Cresent City. Louisiana is renowned for a split, crusty French bread roll, dressed with mayo, tomato, lettuce and stacked with all kinds of fried seafood, roast beef and anything else locally caught, skinned and filleted. It's simply called a Po' Boy -- with a name like that you know why The 99 Cent Chef calls it his favorite sandwich! 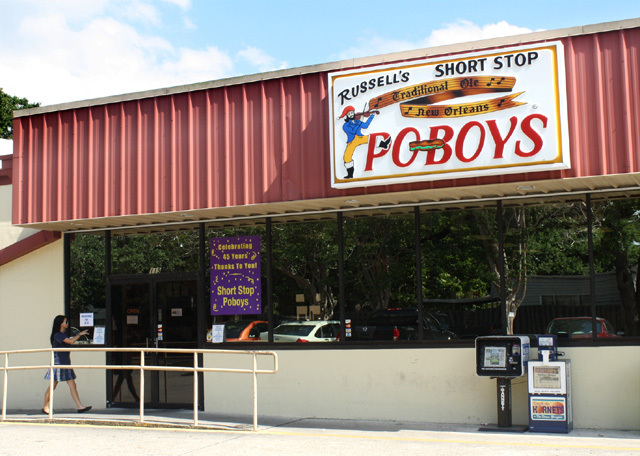 When I am tooling around my high school home town in Gonzales, Louisiana, I keep an eye out for gas stations with an attached market, or restaurant -- this is ground zero for, homemade Po' Boys. Just go past the cash register to the overhead menu and pick out a fried oyster, crawfish, shrimp, catfish, alligator, or roast beef, sausage and deli meat Po' Boy. 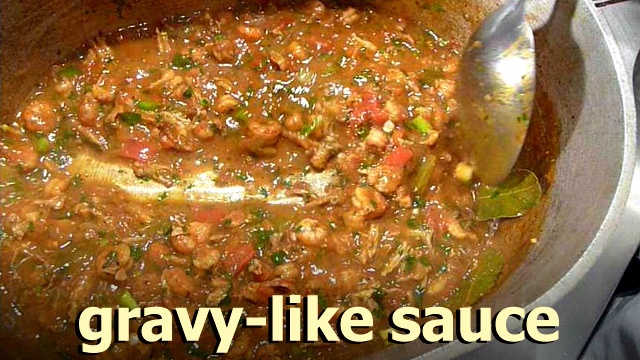 Click here to see a video I did about Cajun Gas Station Dining. I usually get an oyster/shrimp combo or a catfish Po' Boy - they're the best. With a spicy cornmeal and flour coating, the seafood is quickly deep fried then laid out on a French roll dressed anyway you like it...pure perfection. 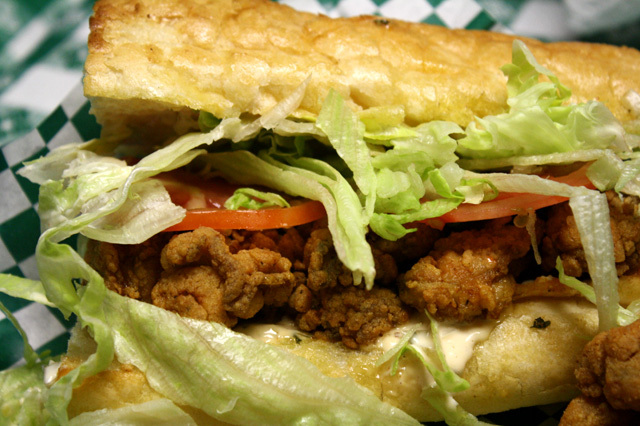 If you are extra hungry, or just want to share, order the Po' Boy "overstuffed." 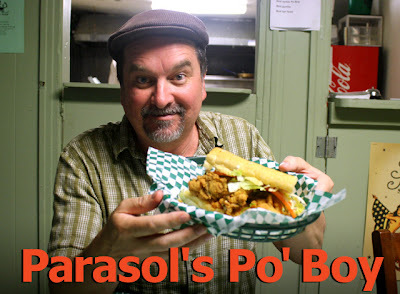 In my latest video, I hit some renowned New Orleans temples to this classic Cajun gastromic delight. 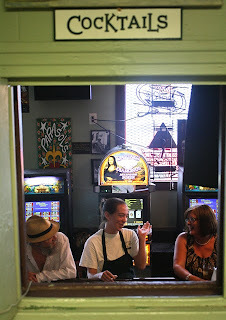 On my Po' Boy tour I was accompanied by my high school buddy, Marvin. 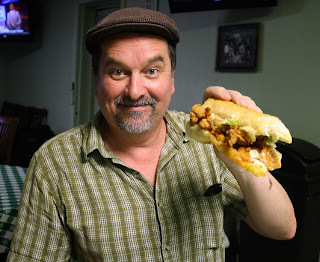 He deserves 99 thanks for filming the chintzy chef in action, and helping to scarf down his share of the three Po' Boys we sampled -- you never have to bag leftovers with Marvin sitting across the table! I barely scratch the crusty Po' Boy surface. I went for the tried and true, but I enjoy a Po Boy whether it's picked up at a gas station deli counter, or decked out by a French Quarter Top Chef (although you are as likely to find The 99 Cent Chef ordering one in an expensive restaurant, as finding an oyster in the Mojave Desert.) So get out the napkins, you are in for a juicy tour of three renowned New Orleans Po' Boy eateries. First up is Short Stop Po' Boys. It's on the Airline Highway - not too far away from the New Orleans airport. 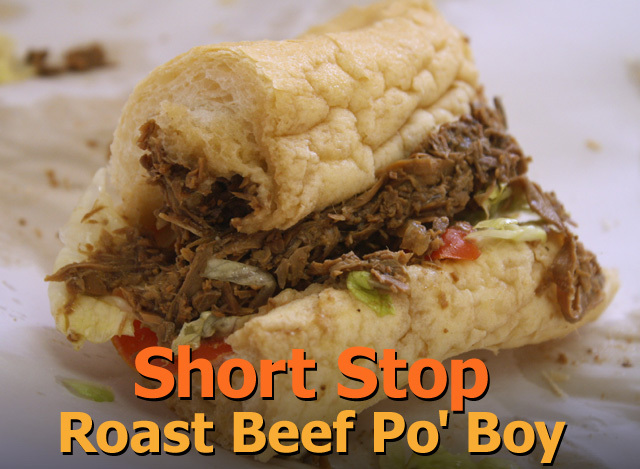 They specialize in a "10 napkin" Roast Beef Po' Boy. Marvin was apprehensive at first, every time he has gone by there the parking lot is full and the restaurant is packed -- but we lucked out. Since it was after lunch hour we breezed right in. 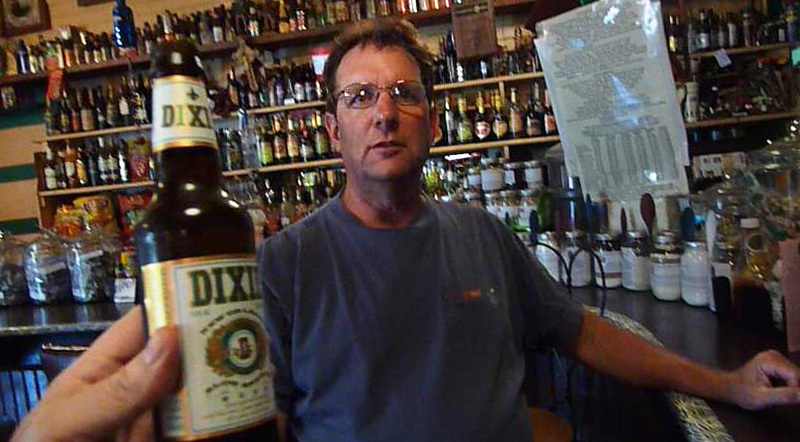 I ordered a small Po' Boy at the counter, then you move on to the register, get a drink and pay. 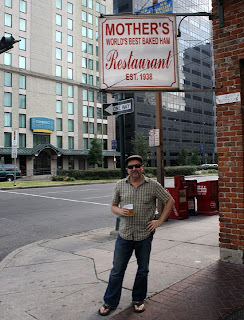 Normally I would order a medium size, but there are more Po' Boys joints to visit. The setting is basic fast food Formica decor. At first bite I found the fine chopped beef mealy. But by the time I was halfway done, I realized it's all about the insanely intense beef au jus. The dipped French roll, and chopped roast beef, are just sponges to soak up and deliver a bursting juicy beef water balloon bomb. You really need do need 10 napkins! I can understand why locals line up. After the Short Stop, we got on the freeway to downtown New Orleans for Mother's Restaurant. 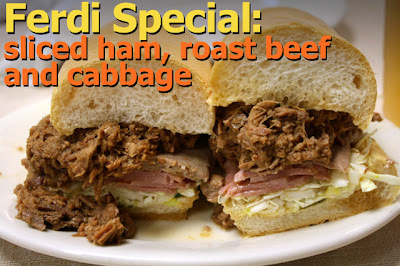 They specialize in a Famous Ferdi Special. It's another roast beef Po'Boy, but theirs is completely different than Short Stop's. First off the sandwich is dressed with a tasty cabbage slaw. 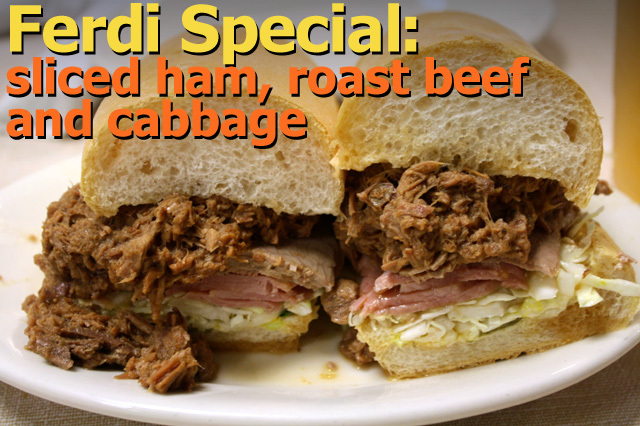 It's closer to a classic deli sandwich with two kinds of beef, chopped and sliced, plus ham. A very meaty meal. I especially liked having a cool crunchy veggie contrast with succulent roast beef and ham. It cost $13 for a regular, or $12 for the 3/4 size. You get a mixed clientele of suits, tourist and locals. The old brick facade gives off an old New Orleans vibe, that is emphasized upon entering, with old photos of hometown dignitaries and vintage newspaper clips (pre-WWII) along the wall, as you head to the deli counter to order. The sandwiches are large and the French bread light and soft - not much of a crunchy shell, but still good. The Po'Boys are huge, so I ordered a 3/4 size. But don't worry, you will still be full -- if you can even finish one! Fortunately, Marvin was there to help me get through it, since there was one more Po' Boy stop. This is a great neighborhood spot I would hang out at. 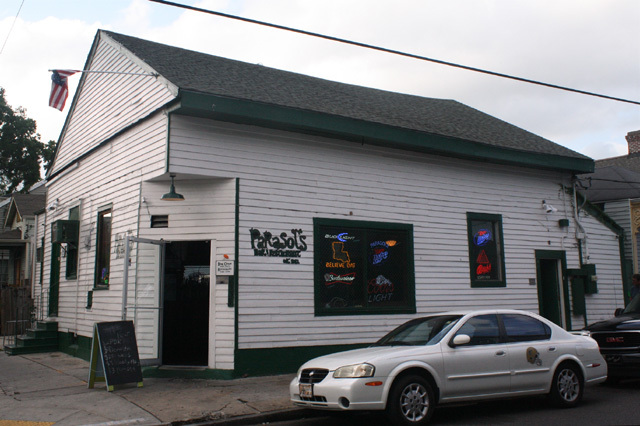 Located in the historic Garden Distric along a narrow tree lined one way street, with rows of long "shotgun" houses, Parasol's is an old wood framed two story Irish bar and restaurant -- with $2 PBR for Happy Hour! The structure is eccentrically built along a sloping sidewalk, where at one entrance you step directly into the first floor bar, and for the second entrance, you take 2 stair steps to enter the second floor restaurant. The half dozen tables are checkered tablecloth covered, and you order at a 1/2 door/window. I recommend the Fried Oyster Po' Boy. The oysters are huge, plump, and the size of a golf ball. It takes 2 bites to eat one! My Mom likes her fried oysters small. 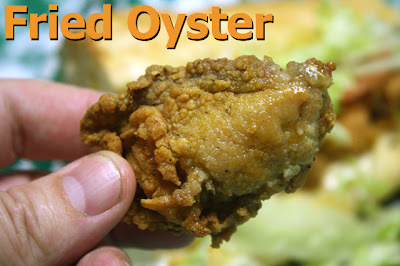 This is where our genetics differ -- I like a large meaty oyster. At Parasol's, fried seafood Po' Boys are slathered with a creamy, tangy tartar sauce, and dressed with chopped lettuce, sliced tomato and pickles. They also go the extra mile of brushing on a herb/melted butter sauce onto their bread, then toast it. Now, Marvin liked it this way. Maybe because I had two filling Po' Boys already, I thought they were gilding the lilly - fried oysters and buttery toasted French bread? It was too much of an oily good thing for me. Next time I would ask to have the bread plain and not toasted, especially with fried oysters. I ordered a half and half small Fried Oyster and Firecracker Shrimp Po' Boy for $13. It was loaded with seafood -- two could easily share the sandwich. The specially chili/jalapeno sauced Firecracker Shrimp are indeed spicy, but not too much so. 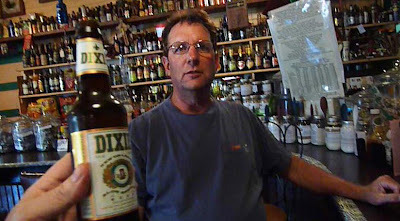 And because there is a bar downstairs, they have a large selection of import and local brews. I stayed with PBR, and Marvin had a Black and Tan (Guinness and Bass Ale.) The fun part of ordering a brewski from the dining room upstairs, was the square porthole that you open (Marvin called it a "Beer Door",) which looks out over the bar, where the bartender operates. Parasol's is like a speakeasy with great down-home Cajun cuisine. I enjoyed Parasol 's immensely and would recommend you stop there to eat and drink, followed by a stroll through the historic Garden District neighborhood. I was glad we finished The 99 Cent Chef's Big Easy Po' Boy Tour here. So get all the delicious video recorded ambiance below. 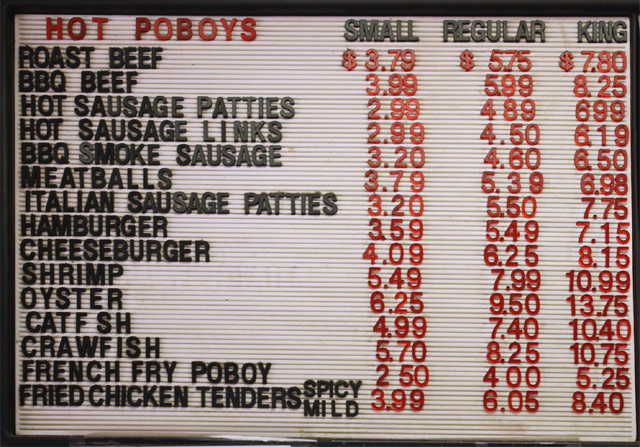 The video Po' Boy reviews are in the same order as listed above. 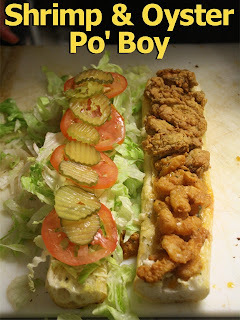 Now you know were to get a Southern classic submarine sandwich when you visit the Big Easy! After the video, I've listed each restaurant with location and their website link. Play it here. The video runs about 8 minutes. 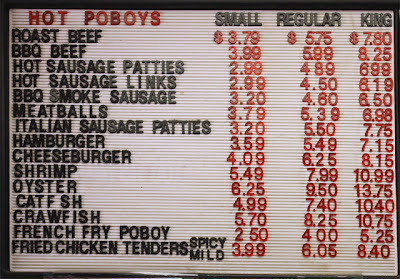 Prices are subject to change, so make sure to check any Po' boy online menu before you visit. 99 thanks to Marvin for his companionship and camerawork. For a good local Los Angeles Po' Boy try The Gumbo Pot in the Mid-City located Original Farmer's Market. 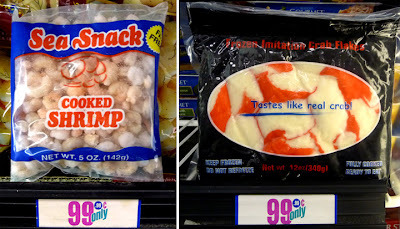 $11.50 for Shrimp or Oyster, or Mixed Seafood. For menu click here. Warning, the seafood Po' Boys have a sour bite because of inserted sliced lemon -- I usually take the slices out.